: Well working scenthound, resistant and persistant, with a sonorous high sounding voice, sometimes deep-voiced. : This breed was registered with the F.C.I. on the 19th June 1965, under Standard n° 155 and under the name of Illyrian Hound. 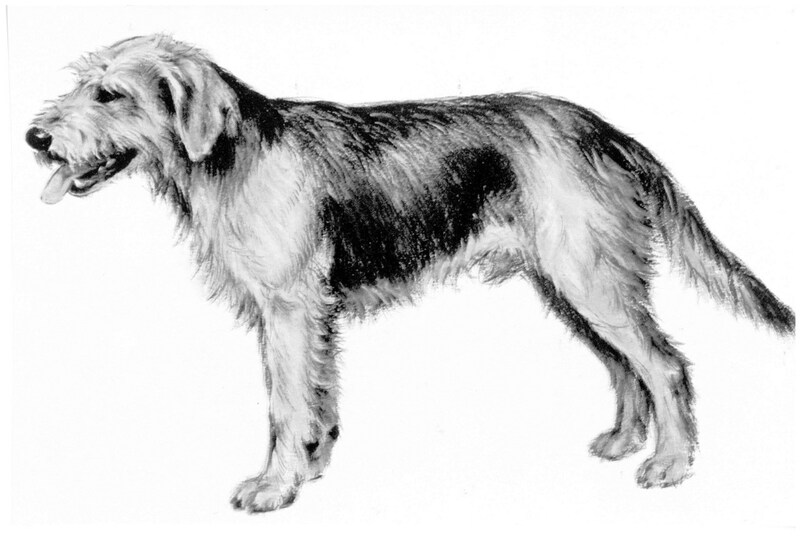 In the present standard, apart from a few complements and corrections, the name of the breed is changed to « Bosnian Broken-Haired Hound - called Barak ». : Robust dog; its coat is long and shaggy; head long and moderately broad, eyebrows pronounced and bushy. The expression serious, severe but playful. The basic colour is reddish-yellow or earthy grey with white markings on the lower parts. : The length of the body must exceed the height at the withers by 10%. : Lively temperament, courageous and persistant dog. : Seen in profile the occipital protuberance well pronounced, the forehead slightly convex, moderate stop, nasal bridge straight. Muzzle in rectangle shape, covered with a bushy moustache and beard. Seen from above the head is of medium width narrowing towards the nose. The muzzle is a little longer than the skull. The total length of the head is about 20 to 25 cm. : Superciliary arches very pronounced. Frontal furrow reveals itself to the touch as moderately developed. : Large, nostrils well developed, black or dark brown. : Strong, long, deep, wider at the base, narrowing towards the nose. : Tight and somewhat thick. : Teeth strong; scissor bite, dentition complete. : Large, oval, chestnut brown, intelligent and playful expression. : Moderately high set, medium long and broad. Pendulous, quite thick, getting finer and rounded at their tip. : The insertion with the head shows a pronounced demarcation. The neck is oblique from top to bottom. Shape: Medium width, increases in depth towards the chest. Muscular. Skin: Tight fitting, supple and covered with dense hair. : The topline runs in a gentle slope towards the croup. : Slightly oblique and broad (especially in the female). Hipbones hardly apparent. : Long, medium width; ribs slightly rounded, in depth reaching; at least to the elbows. Brisket fairly broad. : Well set on, thicker at its base, finer towards the tip and reaching the hock or slightly beyond. Carried slightly curved upwards scimitar like. Very hairy. : Forelegs vertical, straight and parallel, seen in profile and from the front. : Long, oblique and muscular. Scapular-humeral angle: Must be of 90°. : Long and muscular. The elbows are fairly close to the body. : Vertical, straight, muscular and strong. : Pastern joint: Hardly apparent. Pastern: Short, vertical or slightly oblique forming an angle up to 10° with the vertical. Pastern-joint: Hardly apparent. : Cat feet, toes well-knit, pads hard, nails strong and well pigmented. : As the front feet but a little longer. : Hindlegs vertical and parallel seen in profile and from behind. : Of medium length, broad and muscular. : Strong, long, oblique and muscular. : Strong and well positioned. : Perpendicular to the ground, short and strong. : Long and energetic strides. : Of medium thickness, elastic, tight fitting, well pigmented and covered with a dense coat. : Long, hard, shaggy, tousled, with a dense undercoat. : Basic colour can be wheaten yellow, reddish yellow, earthy grey or blackish. White markings are often found on the head (star, blaze on head), under the throat, below the neck, on and under the chest, the lower parts of the legs and on the tip of the tail. The colour can be combined in bicolour or tricolour. From 46 to 56 cm, ideal height 52 cm. : From 16 to 24 kg, ideal weight 20 kg.